Harøya island in Snåsa Lake in Nord-Trøndelag, Norway. Qdulla may sound like a name you could only give to a sea serpent and ... well, it is. Formerly known as Kudulle, Snåsa Lake (Snåsavatnet in Norwegian) in Nord-Trøndelag county is the 6th largest lake in Norway. Created by glacial erosion during the last ice age, the lake is about 40 km long, has a surface area of 121 km² and a maximum depth of 121 meters, providing the mythical sea serpent with ample space to hide. However, in addition to a sea serpent, Qdulla is also the name of a new brewery and restaurant located on the small island of Harøya in Snåsa Lake. This blog post is about the brewery, not the sea serpent. 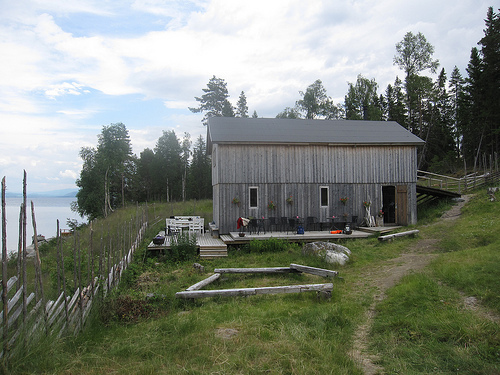 Only accessible via boat, in the brief summer season and after a more than 2 hour long drive from the nearest city - Trondheim - I guess remote is the word I'm looking for to describe Harøya and Qdulla. However, to get the story onto a proper start we need to look back a hundred years. Nord-Trøndelag county has always been a major aggricultural region in Norway, as far back as the Viking era we read about powerful farmer clans and armies. As the population grew, many young men were forced to leave their father farms and clear land for their own. 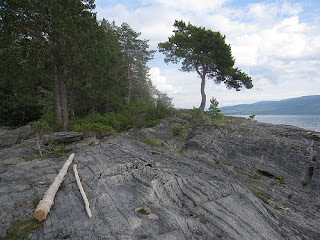 At one point this happened at the small island of Harøya in Snåsa Lake where two croft settlements, husmannsplasser in Norwegian, were in use in the 19th century. Because Harøya island is so small, the croft settlements were small and poor, at most they had a few milk cows, some sheep, a few hen and chicken, and possibly a few pigs. In 1911, the last cotters, Sivert Harøy and his wife Beret Marja, left for the mainland, after their only daughter had emmigrated to America. Harøya island remained devoid of human settlement for the remainder of the 20th century, the old buildings rotting or crumbling into ruins and nature reclaiming the cleared pasture land. If it hadn't been for a husband and wife couple, Harøya would still have been overgrown and inhospitable to human visitors. The "new old" log house at Harøya croft settlement. About ten years ago the farmer Arild Johansen Østvik and his wife, Hilde Østvik, conceived of the idea of reviving the old croft settlement at Harøya, using the island for pasture land in the summer season. After much struggle and arm bending, since the land with the ruins of the old settlements was a protected cultural heritage site, they managed to convince the county and conservation agencies that it would be right to revive the old Harøya croft settlement. 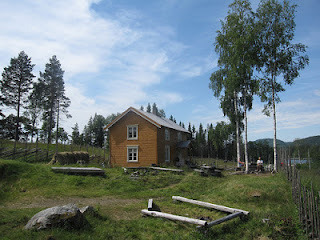 They contacted the local Snåsa Museum to ask about an old log house which had been in cold storage for twenty years, without having been put up for display. The museum agreed to let couple have the house, so it was taken apart, shipped to Harøya and rebuilt near the ruins of the old settlement. In 2007, Hilde Østvik founded Qdulla as a brewery and restaurant. It opened its doors to the public the summer after, in June 2008, and has been open every summer since. As mentioned earlier, a visit to Harøya is not the easiest thing to do. Not only is it geographically fairly remote, wherever you happen to visit from, but you need a boat to get to the island and the restaurant is only open during a short summer season - usually the month of July, give or take a few days. If you're about to plan a visit to Harøya and Qdulla you should first call ahead to make sure they're open and then agree on a time to be picked up by a boat. The person to call is Hilde Østvik on +47 48 99 52 84. Notice that as of the 2012 season, Qdulla is open from 1 pm to 7 pm on all days except Tuesdays and only in July. Because of the harsh winters, the Harøya croft settlement shuts down in the fall. The old barn housing the Qdulla pub and restaurant. Many potential visitors will probably come in their own cars, from the south of Norway or Continental Europe, driving up the E6 highway - the main highway between the south and north of Norway. I personally prefer to fly, landing at Trondheim Værnes Airport and renting a car there. From Værnes, near the town of Stjørdal, it's a 130 km or 1 hour and 45 minutes drive north along the E6. The last stage will be along Snåsa Lake. Exit the E6 to the right at the Østvik sign, which will take you onto a gravel road for about 1 km before you end up by a small marina at the bottom of a steep hill. This is where the "ferry" service to Harøya is. With a booking arrangment in hand you will be met by a private boat at the time you agreed to be there. It will take you and your company out to Harøya, roughly 5-10 minutes by boat. On my visit we were put ashore on the southern tip of the island, but Arild Østvik is planning a harbor on the northern shore with a long pier to allow for larger boats to dock. This pier will probably be in place for the 2013 season. Kdulla: Formerly known as Flekker, Kdulla is a 6% abv German style, unfiltered weissbier, named after the Sea Serpent of Snåsa Lake. Håggå: This 6% abv pale ale is named after a local slang for "desire" and contains a number of local herbs and flowers - such as Bleeding Heart and Heath Spotted Orchid - making it unlike any other pale ale I've tried. Sivert: This 5% abv amber ale was brewed with coffee and named after the last cotter at Harøya, Sivert Harø. Huldra: Named after a female, seductive forest creature in Norwegian folklore, Huldra is a 6% abv sour ale brewed with honey, spruce shots, wild forest berries and sweet gale. Gam-Erik: This is a 9% abv baltic style porter, brewed with smoked malts, licorice and prunes. The name is a local version of Gamle-Erik, which is an old Norwegian name for the Devil. 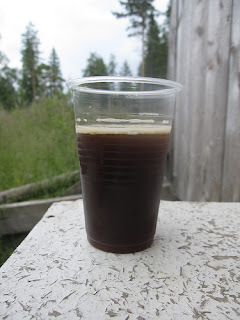 Qdulla Huldra - a Flanders red inspired ale. Qdulla brews beer using a Belgian yeast strain and with an eye towards old ale styles, but also with a focus on local, traditional beer ingredients, such as spruce shots, valerion, honey and sweet gale. According to head brewer, Hilde Østvik, Qdulla has a 500 liter fermentation tank, formerly used for storing milk, but she usually brews smaller batches of 200-300 liter. Because of their status as croft settlement and farm brewery, Qdulla is not allowed to ship its beer elsewhere for sale, so you actually have to visit Harøya to taste these unique brews. Along with the excellent beers, we were treated to a delicious fish soup made with cream from the cows on the island and with trout caught in the Snåsa Lake - you won't find shorter traveled food many other places. My own impressions after the visit to Harøya are very positive; the food and beer were excellent and the place a hidden, natural gem. Hilde and Arild were the perfect hosts, making us feel like part of a great family. They both have plans for future improvements that will take Qdulla and Harøya to new heights. I will surely be back another summer. Do you dare to visit the realm of Qdulla? The southern tip of Harøya island with driftwood. Full set of photos from the July 2012 visit can be found at Flickr. 3 August 2012 edit: As I didn't actually witness any brewing, it may actually mostly be done at the farm on the mainland, not on the Harøya island.